Attention to detail is essential when constructing a home, but getting the right product to ensure an airtight seal at the electrical opening is a vital detail that is often overlooked. 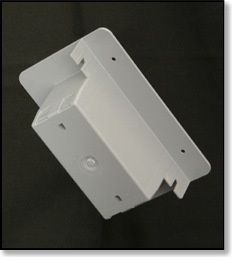 AIRFOIL, INC has developed a line of airtight electrical outlet and device boxes that play a fundamental role in energy efficient home construction. The AIRFOIL® product design is the result of over 20 years of experience in building energy-efficient homes. 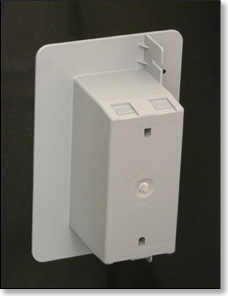 They're easy to install, and once sealed, they stop air infiltration at the electrical opening every time. 1. Construct a high quality thermal envelope reducing heat loss/gain via conduction, convection and radiation. 2. Build airtight to control the indoor environment and minimize infiltration and exfiltration. 3. Utilize the highest efficiency equipment for heating, cooling, hot water and lighting. AIRFOIL® products focus on building airtight. By helping builders and homeowners control the costly and potentially damaging effects of infiltration, AIRFOIL® gives you the advantage when building energy efficient structures. The AIRFOIL® product line provides a visible, positive seal that stops airflow and moisture migration completely. In pressurization (blower door) and thermal scan testing, they stand out from the competition. The one-piece system is easy to install and easy to seal. 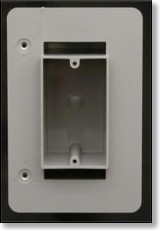 AIRFOIL® products were designed with the builder in mind, so they go in like any typical electrical box. And they’re durable enough to withstand the rigors of construction. You'll gain this high performance advantage no matter what your situation calls for with our four specifically designed models.